The fixture-maker-in-the-sky pays no attention to the demands of heightened drama. 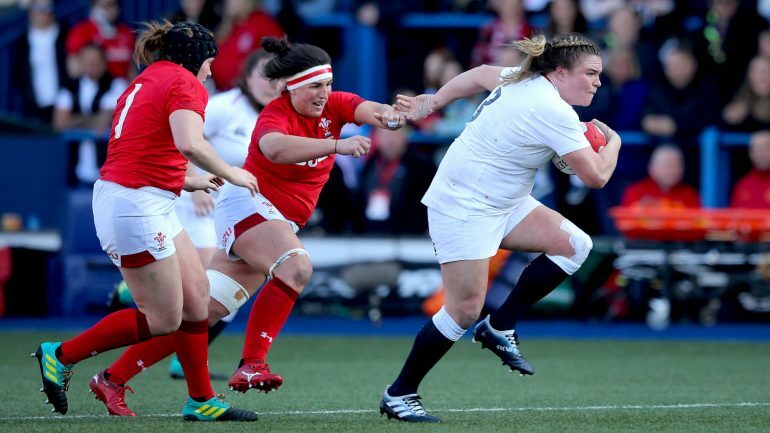 Otherwise the France-England clash would always be placed last – for the women’s 6 Nations at least. England’s last three rounds of the 2019 version see them taking on the sides that finished 4th, 5th and 6th last year. The combined points in the 2018 matches totted up to 137-15. Hence the urgent need to find some means of narrowing the gap in standards. The recent introduction of professional terms for the Red Roses was a huge step forward for women’s rugby, but serves only to widen this already chasm-wide disparity. For Simon Middleton the problem is to ensure that all his contracted players get a more or less equal chance of displaying their qualities during the campaign. With this third selection we get a clearer idea of his thinking. Two of the seven players on EPS agreements have been awarded a starting place (Amy Cokayne and Abby Dow); the rest have had to make do with a place on the bench (Rowena Burnfield, Bryony Cleall and Emily Scott, and today for the first time Claudia Macdonald. Ellena Perry is one of the injured. Carys Williams and Joanna Brown were on the replacement list for the first time too. Sarah Beckett is given the psychological boost of starting her second of three test appearances. Fly-half Zoe Harrison once more plays in the centre, but now from the kick-off. Among the points Rowland Phillips must hammer home to his players will be ‘No turnovers!’ This was one area that did for the French in the last round. Even when they were down to 14, England twice moved the ball away from turnovers so fast that they scored two memorable tries. 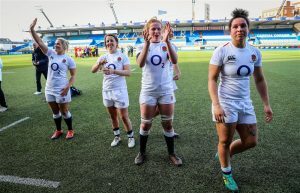 Of Wales’ originally announced squad of 34 at least ten are plying their trade in England: Alicia McComish (Richmond), Elinor Snowsill and Caryl Thomas (Bristol), Bethan Lewis, Cerys Hale, Kelsey Jones, Ffion Lewis and Hannah Jones all with Gloucester-Hartpury, Alex Callender (Valkyries) and Lisa Neumann (Waterloo). Phillips has made five changes for Round 3 – Hannah Bluck, Alex Callender (first start), Mel Clay, Jess Kavanagh and Elinor Snowsill come in. 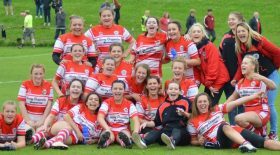 For most of the sunny 80 minutes the Red Roses were in charge. Some of the nine tries they scored were marvels. But Wales stuck admirably to their task to cross the whitewash before the end of each half. Rowland Phillips had prepared his charges well, introducing youngsters like Alex Callender from the start, to give them a taste of the standards that will be expected of them in the future. In refusing to buckle, they put up their strongest showing against England for several seasons. Jess Breach completed a mirror version of her opening score against the French, only this time on the left. 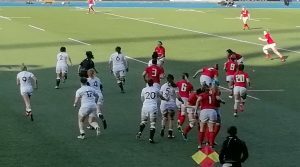 The Welsh defence had left her totally unmarked so she caught Daley-Mclean’s kick-pass unmolested. Then this season’s running gag: a TMO intervention – there had been an earlier knock-on; no try. 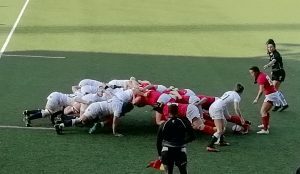 The loudest cheer of the first half greeted a splendid try by Jess Kavanagh, cutting back off her wing to catch the English defence ill-prepared. But England were determined to have the last word. It was fitting that it should fall to Daley-Mclean who had put on another master-class of versatility at outside-half. Her tactical kicking was breathtaking; her control of passing movements ensured the scoreboard kept ticking over. 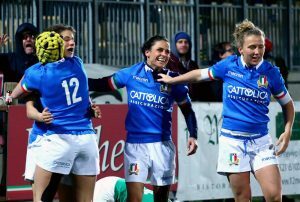 This last result catches the eye, Italy’s first win over the Girls in Green, so a matter of rejoicing. The score itself is a delight: we need more of these close tussles to prove the competitiveness of the Six Nations. Is Italy’s achievement another hint of their growing power? When did they last complete the opening three rounds of the tournament unbeaten? One sombre matter: Emily Scarratt is hopping around on crutches. Let’s hope she recovers fast. We learn she played against the French with pain-killers to help an injured foot. What might have happened if she’d been 100%? It hardly bears thinking about. We still haven’t seen Zoe Harrison operating at No 10, though she did slip into the position of first receiver at the end of the game. Her place-kicking was sound. 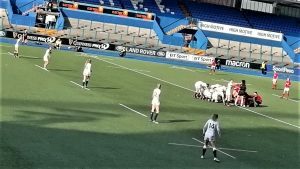 It was good to see an unfamiliar face in charge of the Arms Park game: Clara Murinari of Italy. She kept sensible and unobtrusive control.